A printer friendly version of the 2018 Updated Version of the Handbook can be found here. You will need Adobe Acrobat to read it. Adobe is free, easy to install and can be found here. An older version of the handbook follows. TBD on the time table for replacing it with the 2018 version. The New Hampshire Old Graveyard Association was founded in April 1976 and incorporated in April 1977. Our mission is to discover, map, maintain, record and preserve our New Hampshire graveyards before they are irretrievably lost. These burial places are an integral part of our history and an invaluable resource for genealogists, historians and scholars of New England's cultural history. This booklet was originally published in 1985 under the name Graveyard Restoration Handbook. We would like to thank the original members of the Handbook Committee for their dedication and hard work. This committee included Louise H. Tallman of Rye, Philip Wilcox of Durham, Bonnie Dunton of Farmington and Nancy Van Doorn also of Farmington. Valuable assistance was also received from James Garvin then of the New Hampshire Historical Society, David Watters of the University of New Hampshire English Department and Tom Morgan of the Rockingham Planning Commission. The Cole Brothers of the Exeter Monument Works were also supportive of the careful restoration work that can be done by amateurs. The Handbook Revision Committee of the New Hampshire Old Gravestone Association now includes Doris Ashton of Ossipee, Clark Bagnall of Nashua, Joan Casarotto of Tamworth, Jean Mertinooke of Kensington Trina Purcell of Manchester (Editor), and Louise Tallman of Rye. We also wish to express our thanks to David Watters, whose encouragement, expertise and advice were invaluable to this project. The purpose of this guide is to promote correct methods of identifying, recording, maintaining and preserving New Hampshire's old graveyards. There are many reasons why the members of a community should be interested in preserving these historic places. Our old graveyards are an integral part of our history and an invaluable resource for genealogists, historians and scholars. There are many challenges involved in graveyard preservation. The sites may be overgrown with brush. Markers may be leaning, broken or vandalized. Many stones are succumbing to acid rain, harsh New England weather and age. In addition, family members may be widely scattered, making it difficult to secure permission or funding for maintaining the site. Nonetheless, it is critical that these sites be preserved as the epitaphs on the stones may well be the only source of primary documentation recording a person's life and death. In many cases, this valuable information has been irretrievably lost. Restoration, recording and maintenance of local graveyards is, thus, one form of historical preservation. In addition to providing an invaluable resource for genealogists and historians, old gravestones also serve a cultural interest. Changes in the style of stone used and the symbolic icons engraved on the stones reflect changes in religious and social attitudes of their times. The slate stones of colonial times are now recognized as fine examples of folk art. Victorian monuments often include finely carved artwork and statuary. And though epitaphs may be stock verses, they may also make personal statements about the men and women they memorialize. Gravestones also promote tourism, encourage learning and protect our open space. We encourage people to explore roadside graveyards, or join the many local historians who offer tours. We ask that these old burial grounds be treated with care. Please stay on the paths if there are paths available. Do not touch the stones or attempt to take rubbings--old stones are fragile and easily damaged. Do not litter. Your effort to treat these burial grounds with respect helps preserve our cultural heritage. Graveyard documentation, restoration and maintenance are subjects of some magnitude. This handbook is not intended to be a comprehensive guide to restoration and preservation, but will point interested parties in the right direction for further research. A note on terminology: Historically, the word graveyard was a Puritan term and described a small plot of land where family or community members were interred. The use of the term cemetery was a Victorian innovation. Cemetery comes from the Greek word for sleep and dovetailed with the Victorian penchant for describing death as an eternal sleep. Typically, the term graveyard is used for older burial sites, while cemetery is used to refer to modern, public sites. For the purposes of this handbook we use the terms graveyard and gravesite as general terms to describe any burial ground regardless of size, location or inhabitants. We use the word plot to describe a piece of land that contains multiple graves and lot to describe a single burial place. Graveyards may be found on either publicly or privately owned land. The legal issues surrounding these burial sites are not always clear. Though this handbook provides some guidelines, we encourage you to explore the State of New Hampshire Revised Statutes Annotated (RSAs) that pertain to these sites, and to work with property owners, local selectmen and cemetery trustees before starting on any type of restoration or preservation project. Who is responsible for the care of a family graveyard when the family is scattered, or no longer extant? Maintenance is required only for sites which have established trust funds. There are no laws compelling either the community or the property owner to care for an unfunded site. Conversely, if the cemetery is not specifically under the care of either an individual or the community, neither has the right to uproot the markers, graves, or fencing. A town may vote funding for the care of an "abandoned" graveyard. In this case, the funds must be expended under the direction of the selectmen or the cemetery trustees. Should an individual or community have an interest in preserving a site on private land, the interested party must have the landowner's permission. If the site is on public land, the interested party must have permission from the selectmen or cemetery trustees. Descendants have the right to maintain gravesites, as does the town if the site has been abandoned. It should be remembered that a graveyard is a form of permanent land use. Any work at these sites by individuals or the community is a form of adopting care on behalf of the family. Are family members responsible for the site's upkeep? Families may be scattered or no longer extant. If the family is still extant they have the right to care for the gravesite, but they cannot be compelled to maintain it. Does an individual have the right to be interred in a family graveyard that is on private property? In the case of a deeded lot or plot, the owner has the right to determine who can be buried on the site. If the original grantee is deceased, the RSAs may provide guidelines for determining ownership. These RSAs can be found at your local library or at the New Hampshire State Library. If no deed exists, the legal issues may not be clear and may need to be determined by a court of law. In terms of preserving the site, allowing new burials tends to promote maintenance and preservation of the graveyard. However, it could also be argued that new burials change the "character" of the site. What if I want to visit a graveyard on private land? Though descendants have a perpetual easement allowing them access to the graves, access to a graveyard on private land may still pose a problem. This is especially true in the case of a rear location where the site can only be reached by crossing private property. In this case, even descendants must have permission from the owner of the surrounding property. In the rare instance that this permission cannot be obtained, the selectmen may issue a permit for a temporary right of entry. Preservation is a means of preventing damage due to age, handling, or outside elements. Conservation is a means of restoring an artifact to its original condition. Because gravestones are historical artifacts, any conservation or preservation should, ideally, be done by a professional conservator. However, simple repairs can safely be done by volunteers and non-professionals if a few simple rules are followed. Here are the primary things to know before you attempt any kind of work. Gravestones are irreplaceable primary source documents. Thus, the less tampering you do to them the better. Protect the original historic value and integrity of the stone by altering it as little as possible. Gravestones of the 17th, 18thand 19th centuries are extremely delicate. Damage is easy to do, difficult to undo. Inappropriate conservation techniques, such as the use of bleach to clean a stone, weaken the stone and shorten its lifespan. This damage is not always immediately apparent. In terms of preservation and conservation, it is better to do nothing than to do the wrong thing. · Before beginning any restoration or conservation project, take time to research the project. This will ensure that the project is completed in a manner best suited to both the stones and the site itself. Any repairs must be done using reversible techniques. This will allow us to take advantage of better techniques as they are developed in the future. One of the most commonly asked questions is where to begin a restoration or conservation project. A good way to start is by documenting the site. However, regardless of where you begin, research is an important first step. When documenting the site, first determine if any prior documentation has been done. If so, these records may have been deposited at the local library, historical society or town hall. There may also be a copy at the New Hampshire Historical Society, the New Hampshire State Library or the New Hampshire State Archives. It would be unfortunate to duplicate work that has already been done. However, all prior transcriptions should be verified for accuracy and completeness. Before beginning any restoration, preservation or maintenance, several questions must be asked. First, has any attempt been made to locate descendants who can authorize the work? If no relatives can be found, you must check with the selectman or cemetery trustees for any ordinances related to your local graveyards. Some towns claim jurisdiction over all burial grounds, both public and private. Another important consideration is the issue of continued maintenance of the site. Will volunteers be able to sustain this work, or can funds be voted by the town? Is there a possibility of trust funding from a relative? Prior to beginning the work, it is also important to notify the local police so they will not consider your work vandalism. The nearest neighbors also need to be informed, or they will call the police. Newspaper publicity can aid in explaining your project to the community. Whether the work is done by an individual, or as a community project, it is critical to work with the community and within the law. We stress the importance of research on the best methods to restore old graveyards and the stones they contain. Though non-professionals can do good work, it's critical to understand and use best practices. Poor restoration methods can be extremely detrimental to the life of the stone. Finally, some towns or individuals may elect to consult with or hire a professional conservator regarding gravestone repair. Identifying a reputable and knowledgeable professional can be a challenge. Good guidelines for this can be found in A Graveyard Preservation Primer by Lynette Strangstad. In New Hampshire, one may also contact the Division of Historical Resources for advice (see Section V for their contact information). Documenting a graveyard is one of the most important ways to preserve the information contained there. This is best done using inventory forms and photographs. Using standardized forms ensures that the information gathered is accurate and complete. One of the biggest problems we've experienced is that many of the graveyard inventory projects previously done are missing vital information such as epitaphs, type of stone, and location. We have also worked with many records that were alphabetized by surname rather than by burial location. This makes it difficult for researchers to locate the gravesite. In addition, this may obscure the relationship between family members with different surnames. To avoid this problem in the future, The New Hampshire Old Graveyard Association has developed two forms to aid in the gathering of information. The first form is the Graveyard Survey Form. This form is used to record the name, location and condition of the graveyard as a whole. The second form is the Monument Survey Form. This is used to record information on the individual stones including the type of stone, material used, motif, condition, epitaph, problems and repairs. We encourage you to photocopy, use and distribute them. In addition to ensuring that records are complete and accurate, these forms dovetail with the format of a database being developed by The New Hampshire Old Graveyard Association. The database will be a comprehensive, fully searchable tool containing information on gravesites in New Hampshire. This includes not only information on the graveyards themselves, but also on the individuals buried in them. The database will allow researchers to locate individuals by name, date of birth, date of death, town and cemetery name. It will also contain information on the gravestone itself: its condition, appearance, the epitaph and icon it bears, the material it's made of and its location within the given cemetery. We hope the database will be useful to genealogists, as well as historians and scholars interested in early New England gravestone art. Because the forms and the database follow the same format, the forms make it easier to enter information into the database. Once your graveyard inventory is complete, we recommend that a copy be filed with your local library or historical society, and with the New Hampshire Historical Society in Concord (see Section V for their contact information). NHOGA does not recommend rubbings as a means of documenting the stones. Old gravestones are surprisingly fragile and any pressure on the stone can easily cause it to snap in half. Because of this, gravestone rubbing is often prohibited by law. Photography is a much safer option. Instructions for creating sharp photographs with clear and legible epitaphs are provided in a technical leaflet entitled "Making Photographic Records of Gravestones" by Daniel and Jesse Lie Farber. It is available through the Association for Gravestone Studies (see Section V for their contact information). Before beginning any type of cleaning or repair, it is important to know what not to do and why. Here are some of the techniques to avoid. Proper techniques will be addressed as well. Sand Blasting and High Pressure Water Washing. Neither of these methods should ever be used. They remove a surface layer of the stone itself, a form of mechanical erosion. Bleach. Using bleach to clean discolored marble stones is a temptation to many people. However, it's one of the most detrimental cleaning techniques that can be used. Bleach causes invisible, irreparable damage by eating away at the surface of the stone and exposing a softer at-risk under layer. The exposure of this under layer to the elements causes the monument to decay much more rapidly than it would normally. Bleach also leaves a residue behind that no amount of rinsing can remove. Other commercial cleaners such as Ivory soap and Fantastic pose the same danger. This is because calcium ions in the stone cause the cleaning agent to become insoluble in water. Chlorides are inevitably left behind and these cause migrating salts to form beneath the surface of the stone. As the crystals grow and exert pressure from below, they cause the surface of the stone to slough off. Other harmful cleaners include muriatic acid, phosphoric acid (such as Naval Jelly and Lime Away), alkaline cleaners and corrosive biocidal cleaning materials. Recommended Techniques. The best way to clean a gravestone is to begin with the least damaging product. Start with plain water and a soft brush. Patience and perseverance are the keys to this technique. Remember that whenever two objects (such as the brush and the stone) are rubbing against each other, some abrasion occurs. To minimize this, scrub as gently as possible. Scrubbing from the bottom up prevents streaks. If water alone does not work, conservator's supply houses sell non-ionic detergents that are safe to use on granite, marble, limestone, sandstone and slate. Brand names include Photo-Flo, Triton-X 100 and Igepal. Directions for the proper use of these cleaners can also be provided by the supply house. Soapstone should never be cleaned with anything but water. Even if a detergent is necessary, begin by thoroughly wetting the stone with water. Pre-wetting the stone prevents the cleaning solution from penetrating too far into the porous surface of the stone, and may improve the efficiency of the cleaning agent. Gently scrub it with a soft brush. Scrubbing from the bottom up prevents streaks. Always dilute the cleaner with the recommended amount of water and rinse often with plenty of clean water. Never let any detergent dry on the surface of the stone. A wooden stick such as an ice cream stick or tongue depressor will help clean crevices on slate or granite stones. Don't use anything other than a toothbrush on softer stones such as marble or sandstone. Never use metal implements of any kind. Household ammonia can also be used to clean stones with biological growth such as lichen, but should be used as a second choice when non-ionic detergents don't provide effective results. If you use ammonia, do not exceed one cup ammonia to four cups water. Some conservators recommend not removing lichen as the procedure can open the pores of the stone to a new, and worse, invasion. However, some forms of lichen are acidic in nature, not only obscuring the epitaph and icon, but actually eating into the surface of the stone. Lichen removal must be determined on a case-by-case basis. Other types of biological growth, such as stubborn black algae, can be removed by using calcium hypochlorite. This is available as swimming pool disinfectant. This is a granular product not to be confused with other swimming pool disinfectants such as "liquid chlorine" or sodium hypochlorite. Dissolve one pound of calcium hypochlorite in four gallons of warm water. Use only to remove biological growth. Follow the cleaning procedure described above. Finally, never attempt to clean a stone that appears to be distressed. This is indicated by cracks, flaking, scaling, or a "sugary" (granular) surface. Tap the stone gently to make sure there are no internal hollow areas. If you have any doubt about the stone's ability to withstand the cleaning procedure, don't attempt it. Gravestone repair is a difficult subject to address because we have not yet established perfect preservation or conservation methods. Best practices are still being developed, and there is still some debate over which techniques can safely be used. For instance, though we know for certain that cement is detrimental to old stones, we don't yet know what the long term effects of epoxy are. The information presented here is the best available to our present knowledge. In general we recommend that only reversible methods be used. This will allow us to take advantage of better techniques as they are developed in the future. And above all, the best rule of thumb is to do no harm. Cement. The use of cement in any type of repair is detrimental to the stone. Despite this fact, it is one of the most commonly used methods. Sometimes broken or fragmented stones are encased in cement. This has two unfortunate results. First, the chemicals in the cement can affect the stone. They may eat away at the stone or cause yellowing. The second is that most of the materials used to create historic gravestones (slate and marble for instance) are much softer than cement, and often brittle. As the New England weather gets warmer and cooler the gravestone expands and contracts. Because the slate is weaker than the cement, the stone cracks while the cement remains in pristine condition. Furthermore, the process of embedding stones in concrete is irreversible. If in the future we find a better way of repairing these stones, we won't be able to remove them from the concrete. Sometimes fallen stones are set in a base of concrete in order to get them upright. Unfortunately, the cement provides a conduit allowing the stone to absorb water from the ground. Lime from the cement wicks into the stone as well. The water then freezes and expands, sometimes causing damage to the surface of the stone, often causing it to snap off at the base. Preservative Sealers. Never apply any type of sealer to a gravestone. The sealer will eventually fail and cause a layer of moisture to form between the surface of the gravestone and the (supposed) protectant. Because the stone cannot breathe, the moisture builds up and causes the surface of the stone to discolor and eventually flake away. Steel Supports and Pins. Never drill into the stone in order to affix supports. Drilling weakens the stone. Steel supports rust and cause irreversible and unsightly damage and discoloration. Epoxy/Polyester Resins. Some professionals feel that epoxies and resins may be used safely. Others are concerned about the reversibility of this method. Because there is some doubt as to whether it is an appropriate repair method, we recommend that epoxy only be used as a last resort. Keep in mind that there are specific formulas developed for different types of stones. For instance, epoxies designed especially for granite work best with granite. Polyester resins are typically most suitable for marble. In both cases, sunlight causes the material to deteriorate, and discoloration of the stone may occur. Recommended Materials and Techniques. There are two basic methods of caring for broken gravestones. Stones which are broken in half horizontally, with the base still grounded can be repaired using high quality stainless steel sleeves that hug the vertical edges of the stone. The sleeves are held in place with small amounts of epoxy. There are some nice examples of this method in Forest Hill Cemetery, East Derry, New Hampshire. Another method is the aluminum Nelson Stone Brace which was developed in 2001 and which provides support without the use of pins, cement or epoxy. (For more information on the Nelson Stone Brace see Section V). Keep in mind that both aluminum and stainless steel expand and contract with changes in temperature. The sleeve (or brace) must be carefully fitted so that the support does not crack the stone. Fragmented stones, and stones that are vertically broken need a different preservation technique. We do not yet have a suitable method of repairing these stones. We recommend the following procedure to protect the fragments and keep them together: build a wooden frame that is six to eight inches deep depending on the thickness of the stone. It must be large enough for the stone to lay flat. The bottom of the frame should have a stainless steel screen for drainage. Place a layer of clean gravel in the bottom of the frame. Place the stone fragments on top. Use additional gravel to hold the fragments in place. The frame assembly may be slightly slanted to facilitate drainage. It should be noted that the frame will eventually rot and will need to be replaced. In the case of a stone that is unbroken, but leaning dangerously, we recommend the following method. Dig down into the soil until the stone has been loosened enough to gently pull it into position. This can be a sizeable undertaking as the base of the stone may be nearly as large as the portion that's above ground. 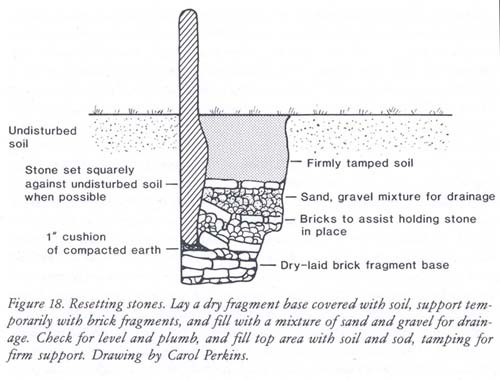 Hold the stone securely in place with gravel or small stones and brick fragments as shown in the diagram below. Never pack the base of the marker with cement. As temperatures fluctuate, the cement will exert pressure on the base of the stone and cause it to snap off below ground level. The gravel provides both adequate support and good drainage. .In the case of a marble stone that has slipped out of its slot, simply clean the slot and put it back in. Use existing pins if possible, and epoxy only if necessary. If the base of the stone has broken off and is still in the slot it may need to be chiseled out, or you may want to consult a professional. Control of plant and tree growth is critical to graveyard restoration. The objective is to prepare the site for regular maintenance by equipment such as a small mower and trimmer. We suggest a listing of all plants found in the graveyard, both woody and herbaceous. Then, decide what you want to keep and what you want to remove. Plan carefully. It's important to study and evaluate each species. For instance, cutting down a softwood tree is an easy procedure. But cutting down a hardwood tree will lead to endless sprouting. In order to avoid this, the stump and major roots must be removed. Other challenges include sumac, lilac, sassafras and some wild roses which spread by underground stolons. Cutting these at the ground level only encourages more sprouting. Poison ivy must be removed while wearing protective clothing. It cannot be burnt as the smoke carries toxins through the air. Trees need particular consideration. Leaving the deep shade of forest conditions will ensure minimum undergrowth, but falling limbs and trunks can shatter brittle stones and ruin fencing. Trees growing too near the gravestones will cause dislocation. Conversely, grassy sites require the regular maintenance of a lawn mower and trimmer. Keep in mind that any type of power equipment is a potential danger to the stone--care is needed during maintenance. Keep in mind that an old graveyard may contain old-fashioned plant materials that are worth preserving. Even wild herbaceous plants on the site may be of interest. The Foss Graveyard in Rye illustrates the range of old garden plants that may be found. Pink Scotch Roses filled the entire front end. Also found were Lily-of-the-Valley, Orange Day-lily, Double Soapwort, Star-of-Bethlehem, and Turk's Cap Lily. Wild materials included Tansy, Virginia Rose, and Carrion Flower. Samples of each were retained while unwanted woody plants were eliminated. Though herbicides can be very effective in removing unwanted plant growth, it is illegal to use these chemicals unless you are either licensed to do so or own the property. Therefore, in most cases, controlling plant growth is largely a matter of cutting and digging. Simple repairs to stone walls and other historic enclosures (such as granite posts and chains) can often be done by amateurs. We encourage this maintenance as the enclosure is often the only remaining feature of an old gravesite. In addition, the New Hampshire RSAs require suitable fencing in the case of municipal cemeteries. However, since stone wall conservation sometimes requires taking the whole wall down in order to rebuild it, you may need to contract with a professional. Gates are also an important feature of old graveyards. We recommend that the restoration of iron gates with decorative metal work be done by a professional. Maintenance is an important part of graveyard restoration. Brush grows back quickly, protective wooden frames rot and must be replaced, stones continue to be affected by age and the elements. Sites may be kept up by neighbors, community members or scouts performing community service projects. Funding may be possible through grants or trust funds established by descendants. Towns may be willing to take responsibility for the graveyard's upkeep. Consultation with town officials and family members will determine which options are open to you in terms of providing routine maintenance to the site. Each town will deal with its graveyards in a different manner. The restoration may be done as a paid project by town workers, or it may be done entirely by volunteer labor. Some towns have been able to coordinate both paid and volunteer work. In other towns, scouts or other community groups have undertaken projects to compile records or maintain sites. Either way, the project will require careful planning and supervision. The past few years have given rise to a wealth of reliable information on how to care for our historic graveyards. We encourage the use of these resources in addition to the guidelines provided by this handbook. The Department of Historic Resources was originally known as New Hampshire's "State Historic Preservation Office" and was established in 1974 as the Division of Historical Resources. The DHR believes that the historical, archaeological, architectural and cultural resources of New Hampshire are among its most important environmental assets. They promote the preservation, use, understanding and conservation of such resources for the education, inspiration, pleasure and enrichment of New Hampshire's citizens. AGS is a non-profit international organization founded in 1977 for the purpose for furthering the study, understanding and preservation of gravestones. Through its publications, workshops and conferences, AGS promotes the study of gravestones from historical and artistic perspectives, expands public awareness of the significance of historic grave markers, and encourages individuals to record and preserve gravestones. The Association's publications include Markers, an annual scholarly journal featuring articles on all aspects of gravestone research, and a quarterly newsletter. AASLH is a non-profit educational organization dedicated to advancing knowledge, understanding and appreciation of local history in the United States and Canada. The Association supports a broad educational program and publishes a series of books on state and local history as well as a newsletter, technical leaflets, and reports designed to help members work more effectively. by Lynette Strangstad Published in cooperation with the Association for Gravestone Studies and the American Association for State and Local History, this book is a comprehensive guide to gravestone preservation. Her purpose in writing the book was to "tell eager would-be restorers what they must not do, what they can do, and how to do it properly." Key topics include strategic planning, working with volunteers, public awareness, documenting graveyards, cleaning and repair, working with professional conservators, ethical issues and more. Repairs to specific types of stone, such as sandstone, are also addressed. Strangstad is the president of Stone Faces, in Charleston, North Carolina. 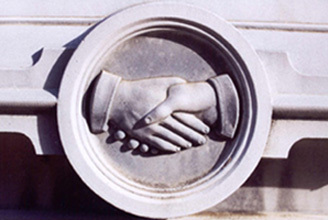 Her company offers service in stone conservation and specializes in gravestone conservation. "Review and Evaluation of Selected Brand Name Materials for Cleaning Gravestones"
by Tracy Walther. An article originally published in Markers, now available through the Association for Gravestone Studies. Graven Images: New England Stonecarving and Its Symbols by Allan L. Ludwig Considered a classic in its field, this book features New England stone carving and symbolism, an exploration of Puritan theology, religious history, folklore and anthropology. The Masks of Orthodoxy: Folk Gravestone Carving in Plymouth County Massachusetts, 1689-1805 by Peter Benes. An interesting exploration of gravestone carving as folk art in 17th, 18th and 19th century Massachusetts. Silent Cities on a Hill: Landscapes of Memory and Boston's Mount Auburn Cemetery by Blanche Linden-Ward. A fascinating look at the Victorian garden cemeteries which became showcases of fine art and architecture in the mid 19th century. The book also explores the Victorian attitude toward death, which is often reflected in symbolic carvings on the monuments they raised to honor their dead. Cemeteries and Gravemarkers: Voices of American Culture by Richard Meyers. A good source of information on ethnic traditions in American culture. The best source for funding is the Foundation Grants Index which is a comprehensive list of grant sources. This index is available at many larger libraries. Lamb-Christ; the Redeemer; meekness; sacrifice; innocence.